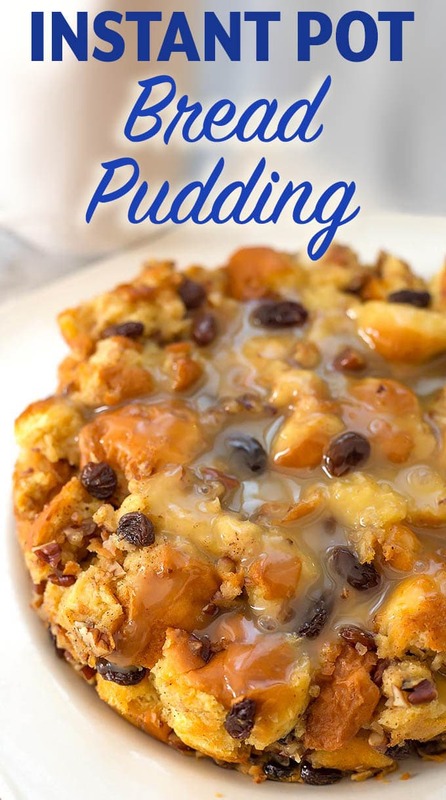 It is so easy to make this creamy and delicious Instant Pot Bread Pudding! This is a must have for our Holiday table. The rich and creamy custard and tasty rum sauce make this pressure cooker bread pudding a family favorite! Just grab some day old bread, I love to use brioche or challah, and tear it into cubes (HINT: when I can’t find a loaf of brioche or challah in the bakery dept., I head over to where the loaves of bread are. I can usually find brioche hamburger buns! They work perfectly! I just set them out on the counter the night before I make the bread pudding!). 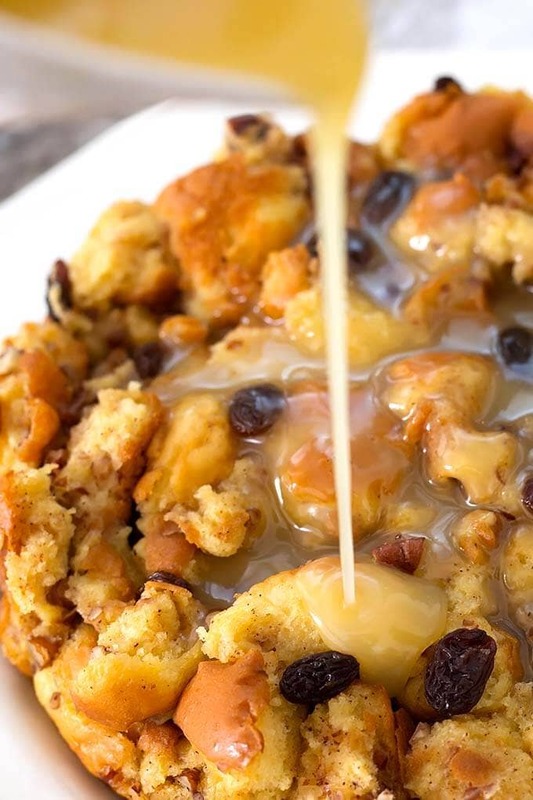 Pour the custard mixture over, pop it in your Instant Pot® or other pressure cooker, and you’ll have yummy bread pudding in less than an hour! If you are concerned with the little bit of rum in the sauce (and used to soak the raisins), just omit it. You can use a tiny bit of rum extract flavoring instead in the sauce, and just soak the raisins in some hot water. 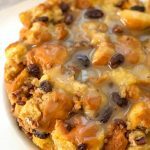 I hope you enjoy your Holiday season, and try this Instant Pot Bread Pudding, it is as magical as the season! 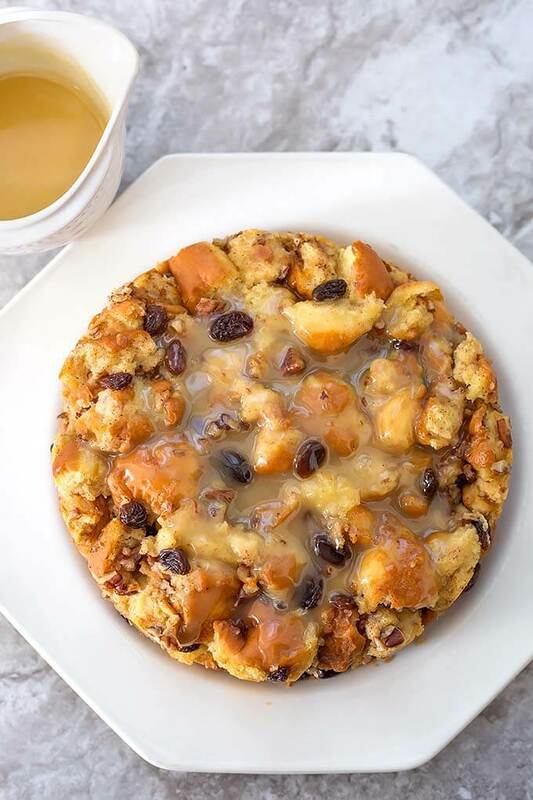 Instant Pot Bread Pudding is the perfect Holiday dessert! Creamy, rich, and delicious. Soak the raisins in the rum for 15-30 minutes (Do not discard rum. Set aside). Or use hot water or hot apple juice to soak them. Place the bread cubes and pecans in a mixing bowl. Toss to mix. Set aside. In a separate bowl, whisk eggs and sugar until well combined. Add vanilla, cinnamon, salt, nutmeg, and half and half. Whisk together well. Drizzle in the melted butter as you whisk. Keep whisking until well combined. Take the raisins from the rum (save the rum) and add the raisins to the bread cubes, tossing to mix. Pour the custard mixture over the bread and lightly mix to coat all of the bread cubes. Then transfer to the prepared pan. Gently press down on the bread to help it absorb the custard. Cover the pan tightly with sprayed foil. Put 1 1/2 cups of water into the inner liner of the pressure cooker. Using a sling, or the handles of the rack, carefully lower the pan into the pressure cooker's pot. It will need to sit on the rack, not directly on the bottom of the pot. Press the Manual (or Pressure Cook) Button, or dial on Ultra. Set time to 30 minutes using the + or - button, or dial. When cook cycle ends, let pot naturally release pressure for 15 minutes. Then manually release the remaining pressure by turning the knob to Venting (or push the button on the Ultra). When the pin in the lid drops, it is safe to open the lid. Open and carefully remove the pan, using sling or the rack's handles (I wear my Silicone Mitts for this). Careful! Let sit covered for a few minutes and prepare the sauce. In a small saucepan, melt the butter and sugar together over medium heat. Whisk in the cream, rum, and vanilla. Let mixture come to a low boil, stirring frequently, then reduce the mixture to a low simmer and let cook for 5 to 7 minutes, stirring frequently. Take off heat and transfer to a small pitcher for serving. Serve Bread Pudding with sauce or without. *You can omit the rum and soak the raisins in warm water or apple juice. For the sauce you can substitute 1/8 to 1/4 tsp Rum Flavoring (extract). Start with the smaller amount. Oh my goodness! This bread pudding was so much better than I thought it would be! I made it for a girl’s night and they all loved it! Thank you for such a great recipe! This was fantastic, I was able to half the recipe and used a 6 inch pan. The sauce turned out delicious, and I am so glad I decided to take the extra step and make it. This is a do again recipe! Hi Tracy! 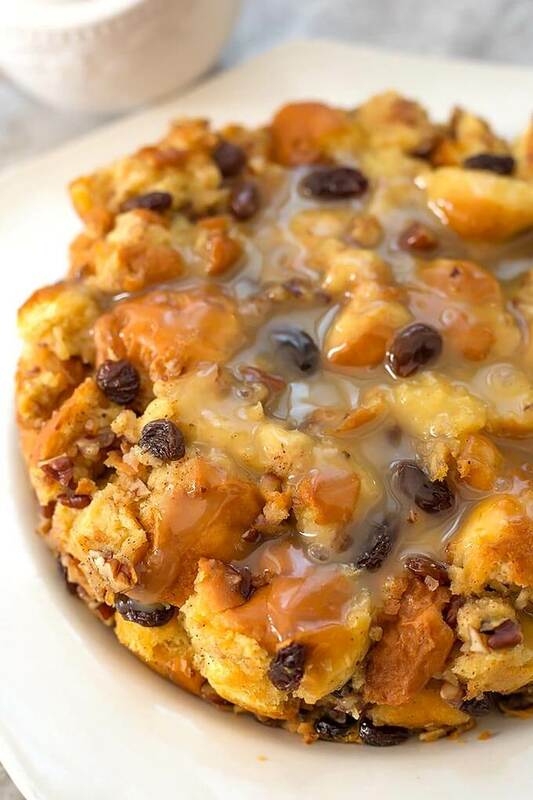 I love that you made this bread pudding recipe in the summer! Isn’t it nice not t o have to use your stove? The sauce is so good, I’m glad you didn’t skip it! Thank you for your review! About how many brioche buns does it take to make 7 cups? 1 bun is about 1 1/4 cups, I just measured it, lol! So about 6. This one is a keeper. First, just reading your story on how you came up and. made this had me jumping right in. I did have to make a few subs. For the bread, my local store sells the bins (like mini French bread loaves) 4 for $1. Way cheaper than brioche. So 4 of these buns = the 7 cups. I also forgot the raisins, but I did have a can of peaches, so I diced them up and they were perfect. Other than that, I was good to go. All the other times I have made this, my husband didn’t even want to try. Said he “hated” bread pudding. He ended up eating 2 bowls. I know right. I was happy he liked it, but sad that left less for me. Good thing it is easy,quick, and inexpensive to make. Because he already asked for more. Thank you for sharing your recipe tips. That’s awesome, Tanya! I love that your hubby is now a bread pudding convert! Thank you for your review! This is, hands down, THE BEST of the IP Bread pudding recipes out there! I’ve pinned it and will make it again. We just indulged on a cold, snowy afternoon here in south central PA. Thank you! I’ll be trying many of your IP recipes for sure! Thank you, Deb! Oh boy, that does sound good right now! Stay warm out there in PA! We’re cold here in the Seattle area, but not as cold as you! If I leave out the pecans, will I have to add or make any adjustment to the recipe?